Cook the pasta according to the instructions on the package. While pasta is cooking heat coconut oil on medium-high and cook onion, tomato, red bell pepper and zucchini in the wok until everything is tender. Add spices and stir well continue cooking on a medium-low heat. In the meantime pulse cashews and pecans/walnuts in a food processor until you reach a “ground beef” look. Don’t pulse for too long as they will turn into a powder which doesn’t suit this recipe, I pulsed my nuts for 10-15 seconds. Mix the nuts with the veggies and cook for 5 more minutes until everything is well combined. 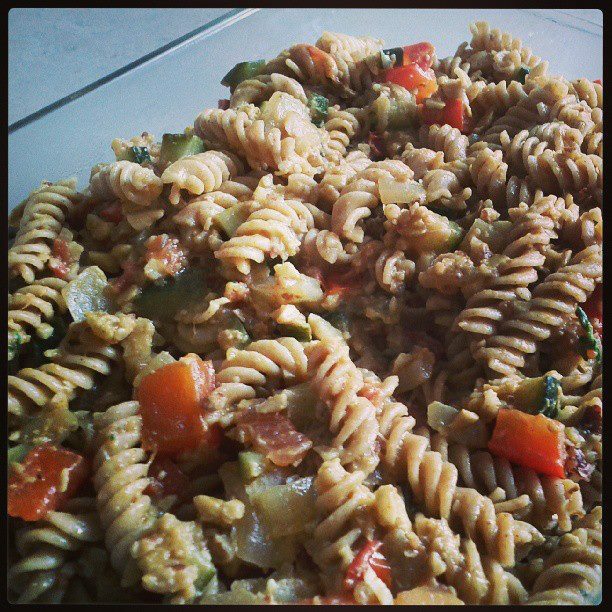 Add the pasta to nuts and veggies and mix everything very well.